If Pinterest and Evernote got married and had a baby, that child would look like Springpad. This Web service/mobile application combo bills itself as a personal assistant that allows you to save, organize, and share ideas and information. And with Springpad 4.0, featuring an enhanced layout that's easier to use and useful search and sharing tools, this free application just might be more useful than either of those digital parents. To begin using Springpad, you simply point your browser to Springpad.com, or download the mobile app for your iOS or Android device. When you sign up for a free account, all of the versions will sync with one another, and with the new 4.0 upgrade, the Web app and mobile apps all share a nearly identical interface, making it easy to switch between them. Once your account is set up, you can begin storing and organizing information to your heart's content. You can use Springpad to create and store text-based notes, photographs from your computer or the Web, or almost any other form of Web-based content. You can install the "Spring It" button to your browser (it works with Chrome, Firefox, IE, and Safari), which allows you to save information and content you come across while browsing the Web. All of the bits of information that you save or create are called Springs, and you can organize these Springs into Notebooks. Notebooks, which can be handy places to store collections of photos, information for an upcoming party or a trip, or movies you want to see, can be set to private or public. Other Springpad users can browse and follow public notebooks, which allows for an easy way to share information. If you'd like to limit the sharing, you can allow other Springpad users to become collaborators on a certain notebook, which allows them to edit, add, and remove content from it. The comparisons to both Evernote and Pinterest are valid, but Springpad isn't a carbon copy of either. While Pinterest allows you to save photos and other images from the Web, much like Springpad, Springpad's organizational tools run a bit deeper. You can add notes to items that you save, for one, and you can save more of a Web page than just an image. And while Evernote allows you to save Web clips and notes, Springpad combines those two features, and allows you to do more with the Web info you've saved. 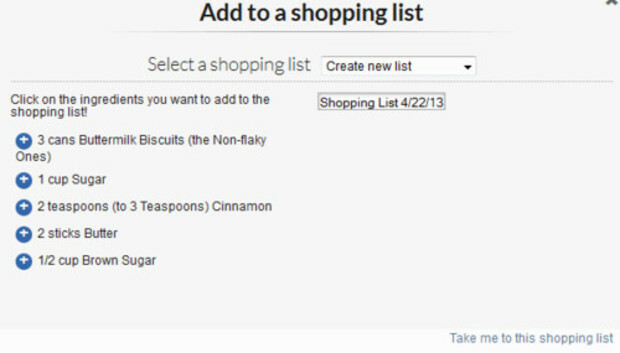 When you save a recipe to Springpad, for example, you can automatically add all of its ingredients to a new shopping list. Then you can access that shopping list from your mobile phone while you're in the store. Similarly, if you save a movie to Springpad, you can find showtimes and see reviews, too. You also can link directly to Netflix and find a streaming version or add the movie to your queue, if you have an account. Using Springpad on an Android or iOS device isn't quite as comprehensive as using it on your computer. The mobile apps make it easy to browse through and search your saved Springs and notebooks (though you're obviously limited by the size of the screen). But it isn't quite as easy to save information when you're not on your computer. Springpad automatically pushes mobile users to the app instead of allowing them to access the Web app from a mobile browser. The app's search tool does allow you to find information you may want to save to your Springpad account, but it lacks the freedom you get when surfing the Web. I like using Pinterest for saving images and Web links of books I'd like to read and decorating ideas I'd like to use. And I like Evernote for storing digital notes and documents. But when I want to save information, organize it, and interact with it, I'll turn to Springpad. It's become my personal digital assistant of choice.